Watching a Bon Jovi concert is great. Being 1m (3ft) away from Jon Bon Jovi is amazing. When Jon Bon Jovi is pointing you, is winking you, is smiling to you, is talking to you, is giving you flowers and is touching you is unbelievable. But when you experience all these things with amazing friends it 's priceless. Yes, we had all the above in Sofia, Bulgaria two days ago. Bon Jovi Web Radio's road trip was the most successful of all. All Joviers - passengers of B.J.W.R. have experienced all the above. Plus we got photos with Obie O'Brien and we talked with David Bergman. I am so happy I met all these fans who trusted us. They are all amazing. I wish there were with us some really good friends from other countries... All Joviers on the bus were acting like they know each other for years... Divine feelings, new friendships were born, I remember the laughter on the bus and the happiness. Some parents escorted their kids to the concert. Huge congratulations to them. They left their jobs just to make their kids happy. We have huge respect for them. There is one person who did a great job and helped a lot and she is helping from the very beginning: natasabj. Without her I don't know if we could make it. We started planning this road trip since October 2012. There was so much pressure. Finally it was worth it! In the stadium we were on the front row and we were cheering our favourite band. The stadium was full and the crowd fantastic. The band? Perfect. Unfortunately Jon's allergy didn't let him to finish the show but still these two hours of the gig were so damn cool. Jon was very disapointed and he apologised but it's a matter of health and we respect that to the fullest. For two hours the crowd was singing along and dancing. Jon announced the name of the stage's car that is Sofia (like the Bulgarian capitol). On the way back to Greece we were tired and sleepless but happy. That's the point, right? It's pitty when we meet so great people, so good friends and we know that we have to split 'cause we live in defferent places... Is this the bitter end? HELL NO! This is the beggining for more meetings with friends who share the love for the best band in the world. You can watch videos and photos on B.J.W.R. 's facebook page. Soon we will post a video from the bus. 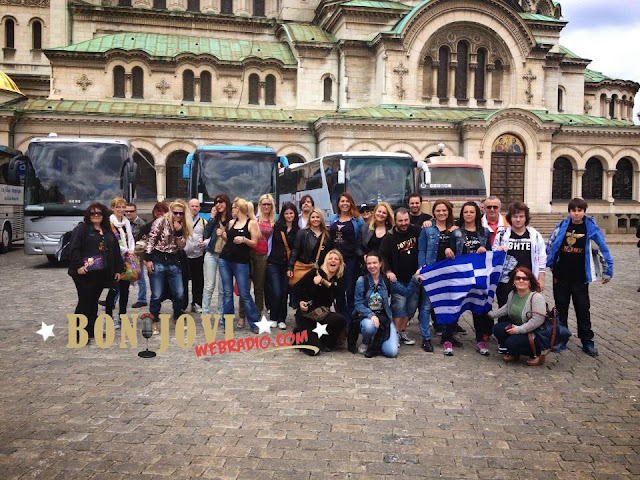 From the bottom of my heart a huge thank you to all of you who support the Bon Jovi Web Radio and especially those Joviers who trusted us for their journey. I really pray and hope the next time to have with us more friends from abroad. For one more time thank you and God bless you all... See ya on the road! K.T.F.